Home/Baby Food Allergies/Food Allergies vs Food Intolerance – What is the Difference? Starting the progression to solids can be stressful for any parent, but when potential reaction to foods is added to the equation, this process becomes even more daunting. There are two main types of reaction that occur: intolerance and allergy. While both can trigger symptoms when the food in question is eaten, they vary quite a bit in terms of severity, onset and risk to your baby’s health. Understanding the difference is essential in order to be able to notice the signs of either one when foods are introduced. The best way to introduce all solid foods is to use the 4 day wait rule. 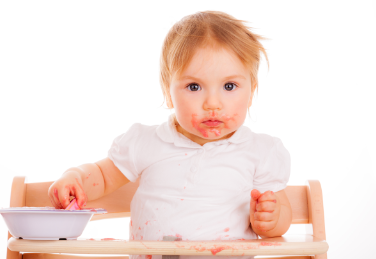 Introduce a single food at a time, and allow 4 days for your baby’s system to adapt to the new food. During this time, you will notice any potential allergy or signs of intolerance. This rule also gives your baby a chance to get used to new tastes and textures slowly, which in turn makes the solid food experience less stressful for both of you. Food intolerance on the other hand is typically a slower reaction that mostly results in digestive problems or occasionally skin rashes. The symptoms are usually less serious, and will often fade quickly after they appear. Sometimes, the symptoms will return only when the food in question is eaten again. Citrus fruits for example can cause mild rashes or small bumps on the roof of the mouth when consumed, or lactose in milk may cause tummy cramps. It is also important to know which foods are better left for an introduction at a later age when your baby is starting solids. Some foods are harder to be digested during the first few months of feeding, which can result in sensitivities. Make sure that you consult your pediatrician before starting your baby on solid foods, and if you have any allergies in either parent’s family history, that you tell your doctor so that he or she is aware of a potentially higher risk of allergies occurring. Making a list of responses and reactions to all foods that are introduced will also make it easier to notice any warning signs early on. This way, you will also be able to see which foods are well received too. If you remember to follow the 4 day wait rule, and keep track of the foods that are introduced, you will find that the solid food journey becomes much less stress for you and for baby. You can use the Kiddo Feedo Food Freezing Guide that came with your Kiddo Feedo Freezer Tray to get a better idea of the best foods to start with (and their nutrient values too).